Nearly 50,000 people filled the seats of Yankee Stadium this past November for the 150th game of the most-played college football rivalry in the nation. Zach Zweizig ’15 barely noticed. Nor did he pay attention to the spirited imagery on the Jumbotron or the ESPN cameras recording his every move. He was too busy staring at the goal post, but the Leopards’ starting quarterback wasn’t visualizing lobbing a touchdown pass. He was searching for his best friend. “My father always told me that if anything ever happened to him he would be sitting on that goal post,” says Zweizig, whose father, Jonathan, succumbed to complications from a stroke two years earlier during Zach’s sophomore season. The economics major from Wyomissing, Pennsylvania, had to resort to envisioning his dad’s presence at the biggest game of his athletic career, a career that almost ended in September 2013 when he suffered a concussion that left him with severe headaches lasting nearly nine months. Concussions are serious business and although anyone can suffer one, athletes, particularly football players, are among those with the highest risk. An estimated 1.7 million people in the United States sustain a traumatic brain injury annually, with approximately 275,000 hospitalizations each year, according to the U.S. Department of Health and Human Services. Despite wearing helmets, football players still face a 75 percent chance of suffering a concussion at some point during their playing career, and depending on the force of impact, injuries can be severe. “By definition, a concussion damages the brain,” says Luis Schettino, assistant professor of psychology. “Though our brain is surrounded by a protective fluid and membranes, it is composed of very soft tissue. Upon impact, the brain may slide back and forth against the skull, causing tears and tissue loss. Repeated incidents may result in graded levels of cognitive malfunction. It’s tempting for athletes who are eager to remain competitive to shrug off a concussion, but Schettino warns that it’s important for individuals to receive treatment and be monitored closely before returning to the field or court. So Zweizig made the decision last spring that he wasn’t going to play his senior year. He couldn’t imagine stepping on a field and not having his father there, and the fear of suffering another nasty head injury was always on his mind. He’s tough-minded, strong-willed, and genuinely a good person. You can’t help but really like him and how he handles himself. He had second thoughts after his girlfriend, Veronica Lloyd ’16, forced him to look more deeply at his decision. He also learned from his Lafayette education that with enough courage and fortitude one can persevere through any challenge. Zweizig took some time and thought about Lloyd’s advice, and two weeks before preseason camp started, he marched into Coach Frank Tavani‘s office and told him he had changed his mind and wanted to remain on the team. Tavani was thrilled that a student-athlete with Zweizig’s intelligence, determination, and leadership would return for his final season. 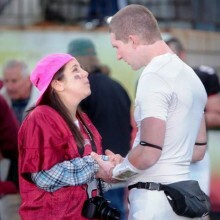 Veronica and Zach celebrate after the win. So when Lafayette’s top two quarterbacks sustained season-ending foot injuries a few days before the 150th game, Tavani had no doubts that his third string quarterback could handle the job, despite not having played a down in 14 months. The rest, as they say, is history. Like a phoenix rising from the ashes, Zweizig delivered a 27-7 victory over Lehigh University before a sell-out crowd in one of the most notable sporting events in Lafayette history. It was an incredible experience, he says, made bittersweet by the absence of his best friend. “I just wished [my dad] had been there to see the game,” he says. He was, Zach. He was sitting on that goal post at Yankee Stadium cheering you on. I had a Lafayette classmate 1960 and fraternity brother (Phi Kappa Tau) Douglas Zweizig. Any relation between the two – Zach and Doug?? ?